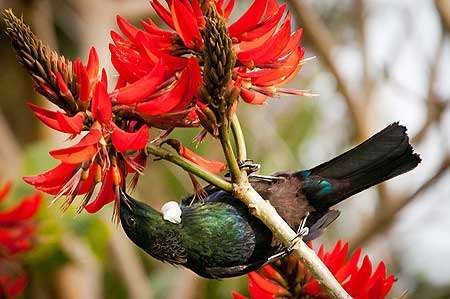 New Zealand's endemic tui (Prosthemadera novaseelandiae) have a tendency to 'jump the fence' when looking to breed, a study by Massey University researcher Dr Sarah Wells shows. Tui are known as socially monogamous birds, pairing with only one partner for a breeding attempt, but this study shows the chicks in their nests are often fathered by neighbouring males. Using the same DNA technology used at crime scenes, Dr Wells was able to track nearly 400 tui and their chicks at Tawharanui Regional Park in Auckland. Finding extra-pair paternity is not unexpected among monogamous birds—the average percentage of extra-pair chicks (chicks fathered by males outside of the pair-bond) is approximately 11 per cent. However, this study found that 57 per cent of all tui chicks were extra-pair – one of the highest rates for socially monogamous birds. "It seems the females are looking for good genes when they are looking to breed. 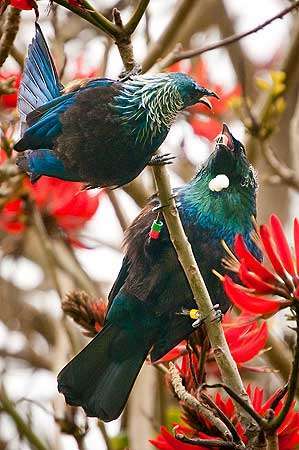 They look for males with bigger white plume ornaments than their nest mate – male tui of a large body size and with large plumes were also less likely to find another male's chicks in their nest," Dr Wells says. "This paternity success of large males is also likely to be the reason for the extreme difference in size between male and female tui, which we found to be the highest among socially monogamous songbirds." Another interesting finding from this study is that both male and female tui go to other nests to "check out" the chicks, staying for several minutes staring at the young until chased off by their parents. In some cases, the intruder was the true father of the chicks. This study was published in the international journal Behavioral Ecology, and gives ecologists insights into the breeding practices of the New Zealand tui which is crucial for the protection of this endemic species. "The tui is an under-researched New Zealand icon. 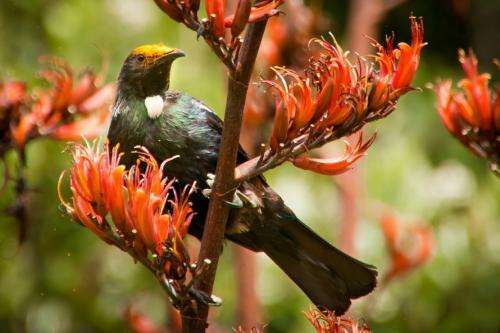 With this study I was hoping to better understand this species and provide knowledge that could help manage threatened populations of tui in remote places," Dr Wells says.